The Dewar Shield was a football competition among the County cup holders of Stirling, Forfar, Aberdeen and Perth sponsored by the Lord Provost of Perth, Mr J.A. Dewar. On the Saturday 4th March 1899 at the Waverley Hotel in Perth two delegates from each of the four counties met to consider the offer from the Lord Provost to present a trophy to stimulate interest in football in the Midlands and North of Scotland. The four County Associations agreed to accept the offer and detailed how the competition would be run. On a motion by Mr Jamie, Forfar and seconded by Mr Walker, President of Aberdeenshire Association, it was decided to have the competition among the cup holders of the four counties and should any club refuse to participate, the County Association were to nominate a replacement. The President of the Stirlingshire Association Mr F. Lindsay’s suggestion to pool all the drawings of the matches after covering expenses for the travelling teams and further meetings and divide the remainder equally among the competing teams was also agreed. The delegates were unanimous in preferring the trophy should be in the form of a shield. The Lord Provost had a special badge designed by Mr R.M. Clerk, Jewellers, Perth, to be presented to the winners. It was of fine gold in the shape of a Maltese Cross with the Lord Provost’s crest at the centre and the names of the four Counties around it. A drawing of it is shown on the right. 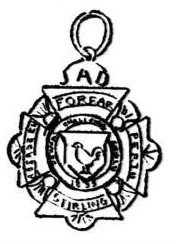 Mr P.M. Dewar, chairman of the Dewar Shield Committee had 11 silver replicas of the badge made to present to the losers at his own expense. Almost £86 was split among the four participating teams of the inaugural tournament once expenses had been deducted from the gate receipts from the three games played in the inaugural tournament. This compared rather poorly to the Forfarshire Cup final iwhich took in over £100 alone for the single match. The Stirlingshire Cup final also had over 3000 supporters in attendance. It seems there was not a great deal of enthusiasm for the new trophy as it did not involve a Perthshire team in the final played in Perth. References: The Dundee Courier & Argus, Monday 6 March 1899, Monday 13 March 1899, Monday 20 March 1899, Saturday, April 15, 1899, Monday, May 01, 1899, Monday, May 15, 1899. Drawing of the Dewar Shield Badge. To be presented to the winners of the final.